LUX* has launched a new luxury resort with premium services in North Male' atoll of Maldives. The resort was developed at picnic island, Olhahali and has been named as LUX* North Male' Atoll. 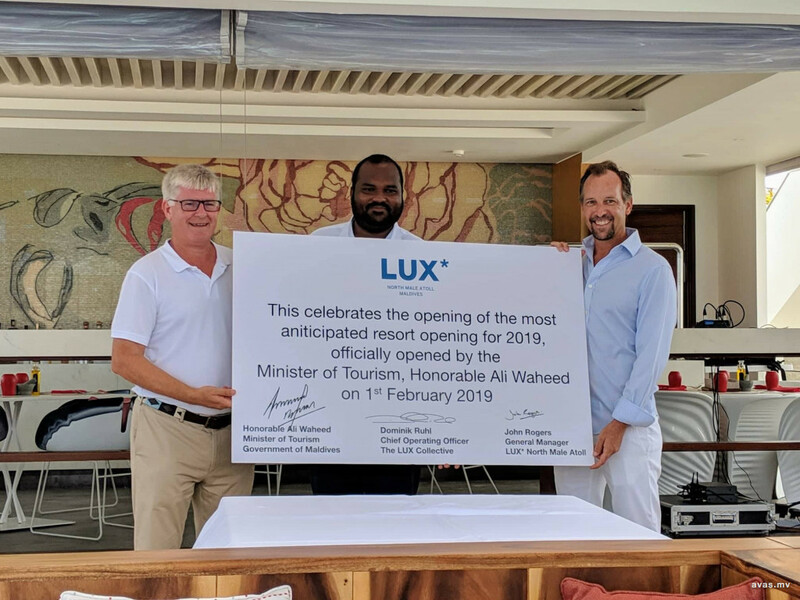 Tourism Minister, Ali Waheed officially inaugurated the deluxe resort on Friday. Chief Operating Officer of LUX*, Dominik Ruhl and General Manager, John Rogers were present at the event. Speaking at the ceremony, Minister Ali Waheed said the new resort displays the true beauty of the Maldivian archipelago. "The work done here is very creative, the design and interior of this resort is top-notch. This is a completely new product being introduced to the Maldivian tourism market. The beauty seen in a picture of this LUX* resort would be at a whole another level", said Ali Waheed. General Manager of the resort, John Rogers said the new establishment would become a prominent high-end resort that offers excellent services. The ultra-modern luxury resort boasts 67 luxury villas and residences. The multi-storey villas spread over six hectares of land displays the exquisiteness of the island. Less than an hour away by speedboat from Malé and the international airport, LUX* North Malé Atoll is only 31 nautical miles (56 kilometres) north of the capital of the Maldives. Designed by joint effort of Miaja Design Group of Singapore and a local Maldivian, the idyllic location amid an unexplored reef teeming with extraordinary sea life, LUX* North Malé Atoll takes its style cues and interior design inspiration from the nautical world.